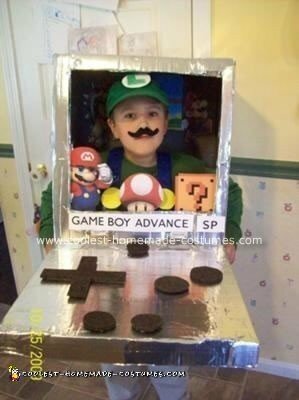 First we took a DELL computer box and used silver duct tape for the Homemade Luigi Inside the Game Boy Costume. We used karate belts (our karate instructor is cringing at this) and used them as Luigi’s suspenders which also helped hold up the box on his shoulders. I used blue duct tape on the suspenders and yellow foam for the buttons. I painted the inside gray and taped computer print-outs of Mario and other Mario Brothers icons on the front and inside the box. We also put in a touch light so the gameboy could turn ‘on’. We used a pizza box for the control panel that used hinges so it could close like a real gameboy does. We used foam for the control buttons. My son used an old baseball hat and put an L on it and I bought him a long-sleeved green t-shirt at WalMart. I got the mustache from iParty. This is in my top five fave costumes ever!